Despite not traveling as far yesterday as I had hoped, I started my ride today still intending to pile on the miles in order to make Missoula this weekend. Once again, I didn't get as far as I planned, but as usual it all turned out for the best. Immediately after leaving Dillon I found myself climbing 1,600 feet to the top of Badger Pass. After days of mostly pleasant weather I was faced today with gusty winds that pushed me in and out of the shoulder, and a pouring rain that kept trying to turn into sleet. Apparently, Montana weather can throw out some chilly tricks even in the middle of July, and for the first time in many a day I had to dig out my rain gear to stay warm. Yesterday a visitor to this site had left a comment suggesting that instead of looking for work when I get to Oregon I just keep on cycling and rely on web subscriptions to pay my way. Now, my ego isn't big enough to imagine that anyone would want to pay to keep me on the road, but the idea had been planted in my head and occupied my thoughts for most of the day. I think that, mentally and physically, I could go for quite a while longer. Certainly not forever, but for thousands and thousands of more miles. I thought about what I would do differently, what gear I would change, and what help I would need. There are differences between saying "I'm riding a bike for the next three months" and saying "I'm riding a bike indefinitely", but they aren't that great. I wondered about where I would go, and toyed with the idea of letting whoever was paying me to be on the road vote for my next destination. I know that I'm not the first person crossing the country to start looking for ways to keep on going when the original destination is reached. I know that when I get to Oregon the first thing I'm going to want to do is rest. But I also know that I'm going to miss being on the road, and although relying on the donations of people who travel vicariously through me is a crazy idea, this entire escapade was a crazy idea to begin with. My thoughts continued in this vein as I crested Badger Pass, descended 500 feet or so, and then started the 1,400 foot climb over Big Hole pass. I imagined myself riding down the California coast into Mexico, or turning back to the east and heading towards Texas. I thought of all the foreign cyclists I've met and imagined myself riding in Australia or Japan or Ireland. And as I was lost in thought I barely noticed the way Montana was changing around me. 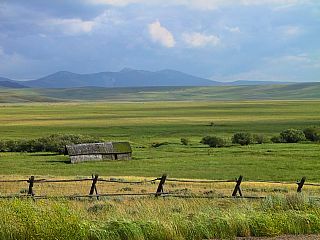 As I rose over the top of the pass I entered Montana's Big Hole Valley and suddenly I was in a whole new kind of country. Gone was the sage and pine, and suddenly there was grass and willow. Perhaps I had been overly comfortable with the landscape yesterday, but today I was someplace entirely new. I stopped in the small town of Jackson (population 38) intending only to have a quick meal before heading on and found that by coincidence there were six other cyclists in town, all of them having arrived in separate groups of one or two. With myself and the later arrival of Albert and Sophie, there were nine of us total and it was an easy decision to call it a day and enjoy the company. There was a married couple from Cincinnati visiting Montana, a pair of sisters about to part ways as one headed home and the other headed to Virginia, a solo cyclist from Britain, and a solo cyclist from Colorado. As the evening wore on everybody slowly wandered off to their tents or cabins, until it was just me and the Belgians left in the bar. Albert motioned to the shuffleboard table and asked me if I knew what it was, so I naturally volunteered to show Sophie and him how to play the game. Now certainly I'm no shuffleboard shark, but somehow I managed to teach them the rules and beat them in our first game by one point. Afterwards they retired as well and it was down to just me and a dozen or so locals. Although it isn't something I've been explicitly looking for, as I've been traveling west there have been a handful of towns along the way where something intangible told me that this would be a place where I could see living for awhile. As small as it was, Jackson was one of those places. Jackson is neither growing nor in decline, it simply is. The people I talked to were happy to be there and happy with their quality of life, happy to be able to hunt and fish, to ski and snowboard and ride their snowmobiles, and wouldn't trade living in the delights of their valley for anything. I've been reading your journal for quite some time now, but never really had anything to comment on above and beyond what everyone else says - great site, pics, and stories. I guess you could say I'm the consummate "lurker". Anyway, Jamie and I talked and thought a lot about you as we traveled to AR to visit family and friends a few weeks ago. We actually spent quite a bit of time during the 13 hour drive discussing aspects of your trip - the reason, the route, your thoughts... so, I just wanted to post a quick note telling you how impressed we are with your trip and wish you good luck the rest of the way. Great pictures of Yellowstone! I just wanted to tell you that I have really enjoyed your trip. It is probably impossible to enjoy it as much as you have, but you write so well and are so detailed that I really feel like part of it. Even though we are good friends and I expect we always will be, in the past several years we haven't had the opportunities to be a bigger part of each others lives, but this web site has made me feel closer to your life than I have since college. 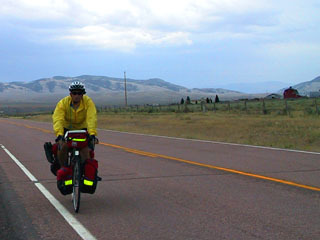 Now that your trip is nearing the end you should peddle slower. I am curious to see what the future has in store for you. Someone as analytical as you, who has had three months on a bike to think about life is sure to come up with some interesting insights about the future. If you find the person or organization that will pay for your travels make sure you share that info with us all! Wouldn't it be nice to all be able to travel a bit more and spend more time with friends and family? The 6 weeks that Europeans take is so civilized. I must admit Nick, you are taking me on a solid mental vacation. What ever you decide to do, you will be able to look back on your trip and it will calm your nerves....By the way, as you know, I am kind of a fly fishing freak. Try the Big Hole River. It is big fun. You are also now in Chief Joseph area. Just imagine the american army chasing you over those mountains in the winter. After I graduated High School and moved to Reno, somehow I drifted out of touch with all my friends. I have no idea how to reach all but one of them now, and even if I were to meet them again our lives have gotten totally disconnected and the friendships have basically dissolved. I told myself in college that I wouldn't let that happen to me again, and I've always tried to stay true to the friends I made there, especially to you. Maybe we haven't been there for each other's day-to-day lives, but we haven't done too badly either. Think about how much effort you and I and Paul and Mike and Rob and others go through to camp in the desert each year. Think about the trips that you and I have taken to Utah and to Mexico. I know I've always made myself go to all the weddings, the one regrettable funeral, and every other important thing that happens in my Reno friend's lives. Though separated by distance, we are united in the bond. The gang of us went through special times together. In a way, we all turned from boys to men together. I'll never replace the memories I have of Reno, and to let the friendships that came from that place drift away would be a waste. Cheers to you Nick, I along with others have been following your journey across the country. It is great that you have been able to share this with us. It has brought us all together in some way, I see names of friends that I have not forgotten or not want to, yes, we all have a bond that would not or could not be broken. I regret that I have not been able to go to the desert but I am always open to correspondance, phone calls, and maybe the occasional road trip. We have spent a good portion of our growing up together and not to get sentimental but I miss it sometimes and WILL treasure it (those memories) forever. I hope that you take the time to come down the Cali Coast and stop by in Santa Cruz or maybe we can all meet up there to celebrate your accomplishment? My thoughts have been with you during your journey. I wish you luck in your future endeavors and proud to call you my friend, brother and acquaintance. As I told you before, you could compile your posts and pictures into a book. I for one would buy a copy. I have sincerely enjoyed your thoughts and impressions of all of the people you meet and places you have seen. Your insight makes me humble, and your experiences have made me hungry for the parts of life that I am missing. Keep up the postings, and consider publishing a book.